Steve Jobs once said, “People think focus means saying yes to the thing you’ve got to focus on. But that’s not what it means at all. It means saying no to the hundred other good ideas that there are.” In other words, sometimes beauty and success come in simplicity and focusing on doing one thing really well rather than lots of things not so well. To me, this is what makes Pizza Brutta such a success. They truly embody this notion. They make a few things, which they have perfected. 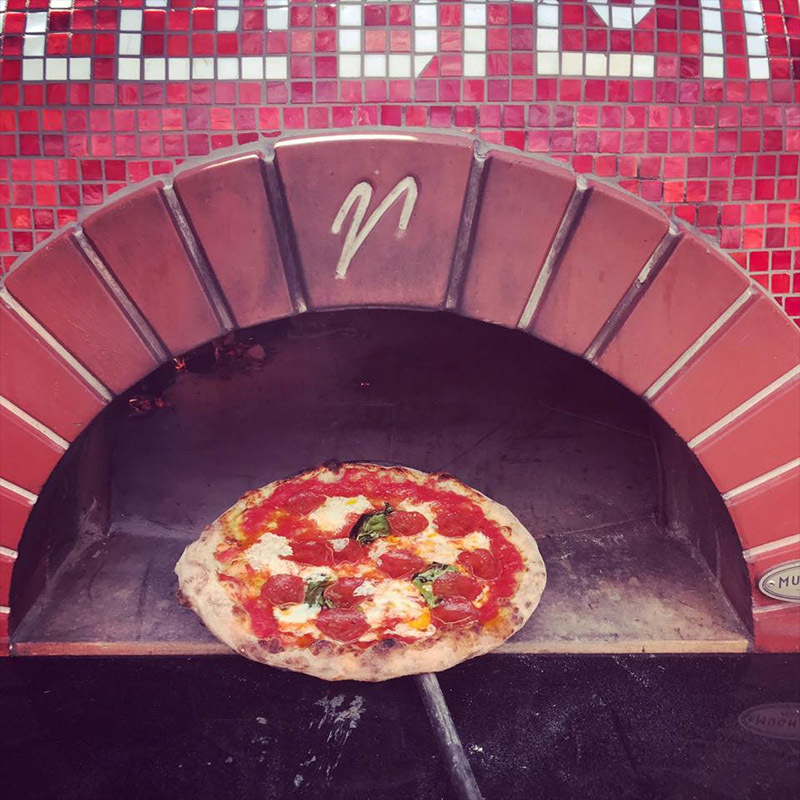 The main focus is on Neapolitan Style pizza created in Italian wood-fueled hearth ovens crafted in Italy. The pizza crust is created with just 4 ingredients: water, salt, flour and yeast. The fresh mozzarella starts with Wisconsin curd and is home made and hand stretched. Italian tomatoes grown in Italy near volcano and sea are crushed to create sauce. The high heat of the ovens creates a crust that is thin and charred with a bubbly crust. There are some specialty pizza choices or build your own. All these start with one of three bases. First there is Margherita which is tomato, basil, and mozzarella. Formaggi is another which consist of tomato, oregano, and mozzarella. And the last is Bianca which has no tomato but instead olive oil, garlic, basil, parmesan, and mozzarella. You can then chose to add meats, cheeses, and veggies to your liking. They source most toppings locally or from known farmers and producers. This includes the wood they use to fire the ovens. My favorites are simple. I love the minimalism of the Margherita pizza. This classic Italian combination is hard to beat. Another favorite is the specialty pizza named Rossoverde. It includes basil, prosciutto, parmesan, and arugula. The salty prosciutto is countered by the bitter and fresh bite of the arugula. The pizzas are mainly single serving but if you add a salad, which are served in two sizes and a number of types, you have a meal for two. They have smaller single sized pizzas for the kids which are affordable and a bit smaller. At lunchtime they also serve sandwiches. The eggplant parmesan and the tuna are both tasty. But it is the pizza that keeps me coming back. There are two Pizza Brutta locations. One is on the near west side of Madison on Monroe Street and the other is in Middleton as part of Middleton Hills. Both are comfortable, family friendly, and a have a warm atmosphere. Hours are daily from 9am-11pm. You can eat in or take it to go but I think the pizza is best when eaten as close to when it comes out of the oven as possible. Eating their pizza straight from the oven can also be accomplished by reserving their mobile pizza oven. They will come to an outside location of your choice and serve up made to order pizzas hot and ready and in about a minute and a half. It really doesn’t get any simpler than that.